Bridgestone Golf, based east of Atlanta in Covington, makes the point they don’t rush to market each year with a new driver just for the sake of being able to say they have a new driver. In fact their last number-one wood was the J40 way back in 2011. OK…fair enough. Based on my familiarity with the company’s club offerings over the past several years, if Kinchen feels this new J715 for mid to low handicaps and pros is special and offers golfers new technology it’s certainly worth my time for doing a thorough test over 10 rounds. The J715 tested was the 10.5 degrees model with the Mitsubishi Fubuki ZT 60 shaft and this proved to be a very nice combination. From the first time I hit the J715 on the range prior to the round I liked the sound and feel at impact. It was solid but in no way had a “soft” feeling as do some drivers. Plus as my experience with the J715 increased, the higher launch design became apparent. Bridgestone, unlike some other makers, doesn’t use slots in the sole to help with face flexibility but instead makes the crown relatively thin near the face getting progressively thicker towards the rear. This helps launch conditions, trajectory, spin, etc., by allowing a lot of flexing in the crown and combined with the milled clubface actually reduces spin by 200-300 rpm according to company tests. The J715 also has adjustments for face and lie angles…up to 1 degree closed and open and 1 and 2 degrees upright. Plus switching the 10- and 4–gram sole weights provides a way to readily effect the trajectory by moving the center of gravity. My friends who hit it had the same impression I did. Great distance and very straight though a couple of them who tend to hit the ball left to right and have swing speeds in the 85-90 mph range still could produce some bananas if they weren’t paying close attention. Negatives. Few, as the Bridgestone J715 is a very credible well-made driver but based on my experience, one you should be prepared to give undivided concentration…then again, you should be doing that with every driver. For those who have to have a clubhead in something other than black you’re out of luck as white, orange, blue, etc., aren’t available. Recommendation. 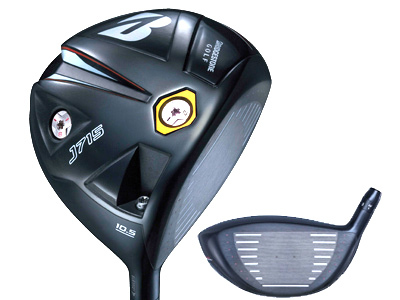 At $400 the Bridgestone J715 isn’t the least expensive on the market but it is a quality driver so if you want to hit the same driver as Matt Kuchar, check it out.